"Thank you for the super easy "how-to" section on cooking a Prime Rib! I'm ... read full review"
Knowing how to cook prime rib requires the understanding of only a few preparation steps and watching the temperature of the prime rib closely as it cooks. The information below will guide you through purchasing, preparing, and cooking prime rib. Prime rib is actually the name used for a standing rib roast. It is very tender, flavorful, and expensive. It use to be that Prime Rib referred to a standing rib roast that was graded USDA Prime but these Prime graded roasts are now generally found mostly in restaurants because of their cost. 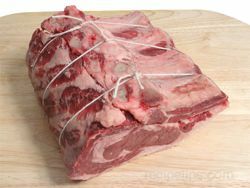 The name Prime Rib is given to the standing rib roasts found in the supermarkets and are generally a USDA Choice grade. USDA grading is determined mostly according to the amount of marbling in the meat. See Beef Inspection and Grading for more information on the differences in the USDA grading. The USDA Choice graded prime rib will provide you with an excellent piece of meat. 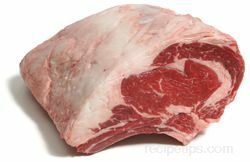 Select a prime rib roast that has a lot of marbling, which is the visible fat running throughout the meat. The more marbling there is in the meat the more moist and flavorful it will be when cooked. When considering the size of prime rib you will need, figure that each rib will feed two people. If serving 5 or 6 people, purchase a 3 rib roast. If serving 7 or 8 people, purchase a 4 rib roast. For best results when preparing a prime rib roast, do not purchase less that a 3 rib roast. A roast smaller with less than 3 ribs is difficult to cook to the proper doneness desired for prime rib. Another fact that is beneficial to know is that the prime rib consists of the seven ribs that are located from the shoulder down to the loin. The ribs closest to the shoulder are less tender than those located closest to the loin. 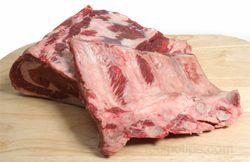 The prime rib roast from the shoulder end is sometimes referred to as the large end rib roast or half standing rib roast. The prime rib roast from the loin end is sometimes referred to as the small end rib roast, sirloin tip roast, or the loin rib roast. When cooking prime rib, it does not require a lot of preparation because you are working with a cut of meat that is delicious in itself. There are many different marinades and rubs that could be used but just salt and pepper is really enough. See the information below on how simple it is to prepare for cooking prime rib. 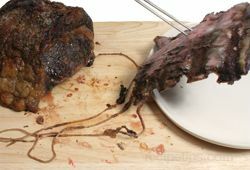 Have the butcher or meat department cut off the chine bones from the bottom of the roast and the rib bones from the meat just along the bone line but do not discard them. They can be cut off in separate pieces or the chine bones can be cut off as one piece with the rib bones. Have the meat placed back on the rib bones and wrap them along with the chine bones to bring home to cook along with the meat. Having the bones cut away from the meat before cooking will make carving the finished prime rib a lot easier. At home, trim the fat anywhere it is over one inch thick. Do not trim to less than a quarter inch. The fat will help to add flavor and keep the meat moist. Tie the meat to the rib bones and include the chine bones at the bottom of the prime rib roast. Tie around the meat and ribs in between the bones on each end, making sure to tie the chine bones to the meat also. Also tie around the meat and bones in the center of the prime rib. Tying the bones on the meat will provide the meat with the flavor from the bones and help keep the meat moist. Be sure to allow the prime rib to set out at room temperature for approximately two hours before cooking. Allow it to reach room temperature before cooking because the roast should not be cold when it starts to cook. 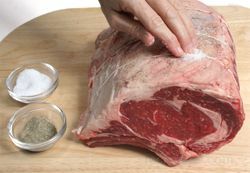 When the meat has reached room temperature, rub the surface of the prime rib, meat and fat, with pepper and kosher salt. Place the roast rib side down in a baking pan or roasting pan that has high sides. The pan does not need a rack to hold the roast because the bones act as a natural rack for the prime rib. The meat is now ready to be placed in the oven to cook. The prime rib does not have to be marinated to be delicious but some prefer using a marinade to enhance the flavor of the meat and some feel that it provides a moister and more tender meat. There are mixed opinions on whether the marinade makes the prime rib more tender. Using your own experience will be the best way to determine what you prefer. For more detailed information on using a marinade, see Grilling with Marinades and Rubs. This information relates to using marinades and rubs for any type of cooking, not only when grilling. Provided below are a couple of simple marinade recipes that can be used with the prime rib but there are many other marinades that can be used. Combine all ingredients except the beer in a bowl and mix thoroughly. Using a fork, poke holes throughout the roast. Place the prime rib in a dish or pan with sides. Do not use plastic. Pour the marinade over the meat. Cover and place in the refrigerator for 2 hours. Remove every 30 minutes and turn the roast in the marinade. Remove from the refrigerator and allow the prime rib to set out for approximately two hours before cooking. Allow it to reach room temperature before placing in the oven. Another method used to enhance the flavor is to use rubs for prime rib. Rubs consist of a mixture of seasonings and other ingredients that are rubbed into the surface of the meat. 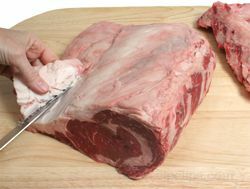 For more detailed information on using rubs for prime rib, see Grilling with Marinades and Rubs. This information relates to using marinades and rubs for any type of cooking, not only when grilling. The recipes provided below are for several rubs that can be used when preparing prime rib. Mix the ingredients listed below and then rub into the entire surface of the prime rib. Rub into the meat and fat. Then allow the prime rib to set out until it is room temperature. No more than two hours before cooking. 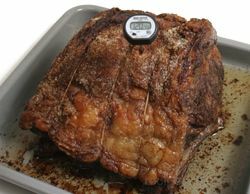 There are many different options on what temperature and how much time to use when cooking prime rib roast. The most important thing to keep in mind is that you do not want to overcook it. No matter what cooking temperatures and times you use, it is most important that you watch for doneness by checking it with a thermometer to be sure it is not getting too done. The information below provides you with one good method of cooking a prime rib. Preheat the oven to 450°F. 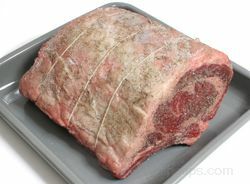 Place the prime rib roast, prepared as shown above, on one of the lower racks of the preheated oven. Cook the roast for 15 minutes with the oven on 450°F. This will sear the outer surface and provide for a crispy exterior. After cooking for 15 minutes at 450°F, turn the oven down to 325°F. Do not open the oven. Cook at 325°F for approximately 11 to 13 minutes per pound. See the chart below for estimated cooking times. 30 minutes before the end of the cooking time remove the prime rib roast from the oven and check the internal temperature. For the roast to be rare the internal temperature should be 120°F to 125°F but remove from the oven when it is 115°F to 120°F and allow to stand for 20 minutes. During this time the temperature will rise about another 5 to 10 degrees. If you want the prime rib to be done medium-rare, return it to the oven and cook a little longer. Check temperature in 15 minutes. Remove when temperature reaches 125°F. Do not overcook. Note: The doneness temperatures stated above and below are traditional temperatures used for cooking prime rib but are not recommended by the USDA. See Beef Doneness for more information on beef cooking temperatures. 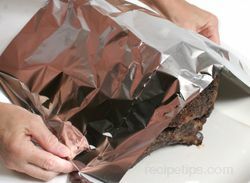 Remove from the oven and loosely tent aluminum foil over the prime rib and allow it to sit for at least 20 minutes. This will allow the juices to redistribute through the meat. After the prime rib has rested it will be ready to carve and serve. See Carving Prime Rib below. then turning down to 325°F to finish cooking. The cooking times below are approximate times only. Check doneness with a thermometer to be sure the prime rib is cooked properly. Watching for proper doneness is very important when cooking prime rib. The best manner in which to do this is to check the roast's temperature. 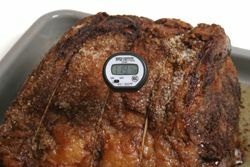 A meat thermometer can be inserted in the prime rib before placing it in the oven but it may be hard to read the temperature closely at the end of cooking time. An instant thermometer works very well because you can insert the thermometer towards the end of the cooking time and get an accurate reading in about 15 seconds. The temperature you cook the meat to will depend on how you want your prime rib done. Prime rib is generally cooked to rare or medium-rare. Cooking it more than that will start to result in too much of the roast being overcooked. Keep in mind when cooking the prime rib until it is rare will result in the outer slices being done closer to medium-rare. Cooking the roast until it is medium-rare will result in the outer slices being done closer to medium. See the charts below for different levels of doneness temperatures and how they appear visually. The chart below shows the temperatures of the different doneness levels of the prime rib and how it will look visually at those levels. The center is red with it turning pink towards the outer edge. 130° - 135°F The center is dark pink with the meat beginning to turn light brown towards the outer edge. The center is a light pink with more of the meat turning brown towards the outer edges. 150° - 155°F The center is light brown with the meat darkening towards the outer edges. 160° & up All the meat is evenly brown. If you had the chine bones and rib bones cut from the prime rib when you purchased it, carving is very simple. If you did not, the bones will need to be removed before carving. Remove the chine bones with one cut across the bottom of the roast. Then remove the rib bones by cutting parallel along the rib bones, cutting them away from the meat. Do not discard the bones. There is sure to be someone who will enjoy eating the delicious meat from these bones. The information below shows how easy it is to carve the prime rib if the bones were cut off by the butcher or meat department when it was purchased. 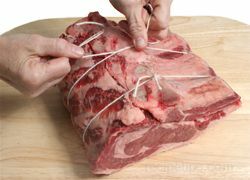 Place the prime rib roast on a cutting board and cut the strings that are holding the bones to the meat. Remove the string and separate the bones from the meat and set aside. Keep the bones for someone who will enjoy eating the meat from the bones. Lay the prime rib roast on the cutting board with the rib bone side down. Cut slices across the grain of the roast to desired thickness. Slices are generally cut 1/4" to 1/2" thick. Only cut the number of slices you will be serving from the roast. This will keep the leftover meat more moist for the next time it is served. Prime rib is good served with most any side dishes you desire. A traditional side that is served with prime rib is Yorkshire pudding. This dish is made with some of the drippings from the roast so is a great accompaniment to the prime rib. A horseradish cream sauce is a popular condiment served with prime rib and of course, the Au Jus juice is most often drizzled over the meat when served. The recipes and preparation of these serving suggestions are shown below. The Au Jus is prepared from the drippings produced while the prime rib is cooking. 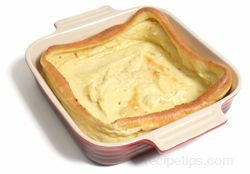 Pour off the fat from the drippings and discard or set aside to be used for the Yorkshire pudding. 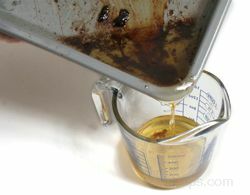 If there are a lot of juices along with the fat, using a gravy separator works well to separate the fat from the juices. If there are juices from the drippings, pour the juices only back into the roasting pan. Discard all but 1/2 cup of the fat if making Yorkshire pudding. Add 1/2 cup of beef broth to the roasting pan and cook over medium heat. Stir and deglaze sides and bottom of the roasting pan to get all the browned pieces to add flavor to the juice. Bring the juices to a boil and cook until it is slightly reduced to intensify the flavor. Cook for approximately 2 minutes. Season the juice with salt and pepper to desired taste. Pour Au Jus into a gravy bowl and drizzle over the prime rib when serving. Prepare the pudding while the prime rib is set aside resting. In a mixing bowl, combine all the ingredients except the pan drippings from the roast. 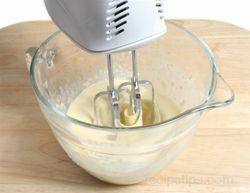 Beat these ingredients with an electric mixer until smooth. Preheat the oven to 450°F. 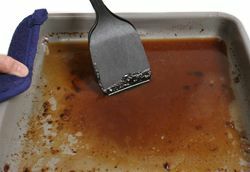 Pour the pan drippings in a 9 inch square baking pan. 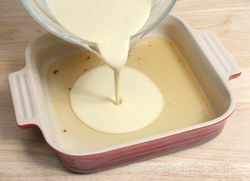 Place in the preheated oven to heat drippings for approximately 5 minutes. Drippings should be very hot. 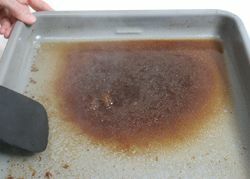 Remove the baking pan from the oven and pour in the pudding batter but do not stir. Place back in the oven and turn oven temperature down to 350°F. Bake the pudding for approximately 30 minutes until it has puffed and turned golden brown. Carve the prime rib while the Yorkshire pudding is baking. When the pudding is done, cut into squares and serve with the prime rib. Mix up the horseradish sauce at least an hour before serving. It can be made up 1 or 2 days before hand and then refrigerated until ready to serve. 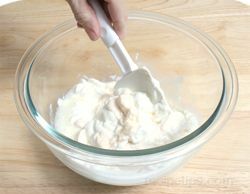 Place all the ingredients in a mixing bowl and stir by hand until thoroughly mixed. Note: A commercial horseradish sauce can be used in place of the prepared horseradish to provide a milder taste if desired. 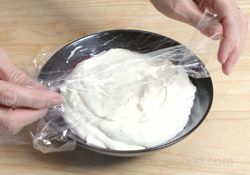 Pour into a small serving bowl and cover with plastic. Refrigerate for at least one hour. These are just several serving suggestions. Gravy can also be made from the pan drippings and served with potatoes or drizzled over the meat. The prime rib will be delicious served with any of your favorite side dishes. "Thank you for the super easy "how-to" section on cooking a Prime Rib! I'm cooking it for my birthday dinner :)"
"Made this last night and it was excellent! The prime rib came out perfect!" "My prime rib was FANTASTIC with your help! Thankyou!" "I am cooking an 8 lb prime rib this Christmas Eve for dinner. This is helping me a lot. Thank you for this information." "Thank you for all your cooking tips & instructions. Everything is so helpful." "I am cooking a whole (22 lb) untrimmed rib roast for the first time this Christmas. I think I have it down how to trim and cut the chine bones and ribs off. My question is this: will the roast cook with better control if I cut it into 2 smaller roasts? I want to control the doneness- Also, when retying the bones back to the roast, they go on the same direction they came off, right? Thanks so much for your input!" "I am making prime rib for Christmas for the first time. This article makes it look easy. I am going to use these instructions so I am hoping for success!" "This information is making my mouth water. We are having prime rib for Christmas and I can't wait. I am going to try the Onion Prime Rib Rub and the Horseradish Sauce looks interesting. I might have to make that too." "I used this information last Christmas to prepare our prime rib and it turned out perfect. I forgot to add this information to my favorites and was afraid I wasn't going to find it this year. Glad I found it and it is in my favorites now. Great information!" "Wow! Thanks for all the information on cooking prime rib. I am making it for the first time for Christmas and wasn't sure how I should cook it. This information is really helpful. Thanks!" "I love trying new recipes and sharing with friends ... so I'm always looking for great recipes. This recipe is probably the best, most well thought out and delivered recipe I have come across. I will be following this recipe for Christmas dinner and can't wait to give you a recap. Thanks so much for the time taken to write this excellent recipe/tip." "Thanks for the great information on how to cook a prime rib. I just bought one to fix for a special occasion this weekend and had never prepared one before. I didn't want to ruin it so this I really appreciate all this information. I feel better about fixing it now." "Super Bowl Sunday I'm giving it a try with a big pr let you know how it turns out. The recip looks like its going to turn out just like my family likes it. Grate explanation thanks Enjoy the ny-ne game." "I followed the instructions to a T and the Prime rib was perfect. 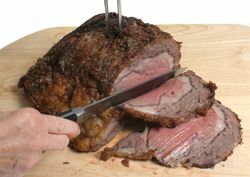 Kudos"
"This is my first time making a prime rib roast and I am so glad I found this site. These are the most complete instructions I have ever seen on a cooking site. You're my new recipe bff! Thank you!" 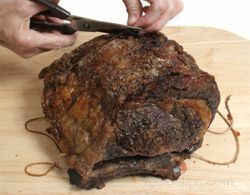 "Absolutely the most informative article on "how to" cook a perfect Prime Rib Roast." 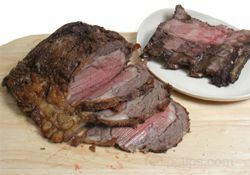 "This is by far the best, most informative article I have ever seen on the topic of Prime Rib/Standing Rib Roast. I've been preparing Prime Rib for over thirty years and I was looking for an informative article to pass on to a friend when I found this one. This is going to save me a lot of typing! Thank you, I think I've just found a new favorite cooking site!" "I cooked my first Prime Rib ever and followed the site to a T!! It turned out absolutely perfect....I also made the suggested fixings with it, the Yorkshire pudding and the horseradish dipping sauce again perfect!! Thanks for the help I will definitely be making it again!!" "I cooked a 22pound prime rib that was not given any love from the butcher (all bones and chine bone in tact) wonderful the yorkshire pie was ok forgot to heat up the drippings first. Thanks"